Anne Lamott speaks to my soul. In her phenomenal book, Help Thanks Wow: Three Essential Prayers, Lamott focused on how we communicate with the Almighty. 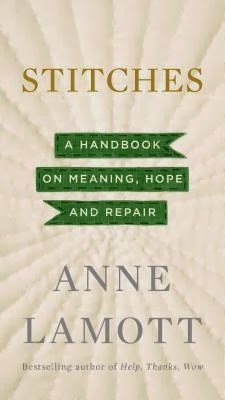 In Stitches: A Handbook on Meaning, Hope and Repair, she muses on healing and wholeness. Drawing on some truly horrific recent events, including the Sandy Hook Elementary shooting, she asks universal questions that billions of others have wrestled with. "Where do we even begin in the presence of evil or catastrophe -- dead or deeply lost children, a young wife's melanoma, polar bears floating out to sea on scraps of ice? What is the point of it all when we experience the vortex of interminable depression or, conversely, when we recognize that time is tearing past us like giddy greyhounds?" The answers Lamott offers boil down to truth, authenticity, and love. Naturally, this requires us to allow other people into our lives and involve ourselves in the lives of others, or as she puts it, "sticking together as we try to make sense of the chaos." For an introvert like me, even one who likes people, this is scary. It's uncomfortable. It's hard. It feels less safe than keeping to ourselves. Lamott recognizes this and acknowledges it, but points out the value of leaving our comfort zone. It is most comfortable to be invisible, to observe life from a distance, at one with our own intoxicating superior thoughts, But comfort and isolation are not where the surprises are. They are not where hope is. Hope tends to appear when we see that all sorts of disparate personalities can come together, no matter how different and jarring they may seem at first. And that's the way God designed it. Above all else, He's a Father, a Teacher, so He wants us to learn and grow, to heal and progress, and the best way to do that is by helping each other. "God could do anything God wanted, heal and create through weather or visions or the ever popular tongues of fire, but instead chooses us to be the way, to help, to share, to draw close." We can be a strength to others during difficult times, even as we feel they are providing strength to us. "In the cold wind, if you can lean against others, none of you will blow away. You keep each other from falling or help each other get back up." Anne Lamott chooses her words carefully, and her books - while short - are packed with both profundity and gentle humor. Her intimate, comfortable, relationship with Deity is apparent when she declares, tongue in cheek, "I know God enjoys hearing my take on how best we should all proceed, as I'm always full of useful advice." She reminds us to be true to ourselves and not to worry too much about what others think, with a recognition of the challenges of blazing our own trails: "It is not now and never was in anybody's best interest for you to be a seeker. It's actually in everybody's worst interest." We found in books the divine plop, the joy of settling down deeply into something, worlds and realities greater than our own troubled minds. All of life, for me, begins with books and art...When you love something like reading--or drawing or music or nature--it surrounds you with a sense of connection to something great. If you are lucky enough to know this, then your search for meaning involves whatever that Something is. Lamott shares her struggles with alcoholism, how she has dealt with and overcome her addiction, and the lessons she learned in the process. Those who helped her get sober, her true friends, taught her that "maturity was the ability to live with unresolved problems...They taught me that being of service, an ally to the lonely and suffering, a big-girl help to underdogs, was my best shot at happiness." In this process of healing and becoming whole, relationships are vital. They prompt personal growth by helping us reach outside of ourselves, but also providing loving support for us with all of our flaws. One of the hardest lessons I had to learn was that I was going to need a lot of help, and for a long time. (Even this morning.) What saved me was that I found gentle, loyal and hilarious companions, which is at the heart of meaning: maybe we don't find a lot of answers to life's tougher questions, but if we find a few true friends, that's even better. They help you see who you truly are, which is not always the loveliest possible version of yourself, but then comes the greatest miracle of all--they still love you. They keep you company as perhaps you become less of a whiny baby, if you accept their help. As a result, she decided, "this is who I want to be in the world. This is who I think we are supposed to be, people who help call forth human beings from deep inside hopelessness." Paraphrasing her initial questions, she closes the book with this simple summation: "Love is the question: How can it possibly be enough this time, in the face of such tragedy, loss or evil? And it is the answer: It will be."